Very easy to grow, and a great plant for naturalising into a shaded garden Dicentra formosa are commonly called the ‘Western Bleeding Heart’. A number of forms with different coloured flowers are available fro sale, and this is a remarkably hardy plant, coming back year after year with little extra care. 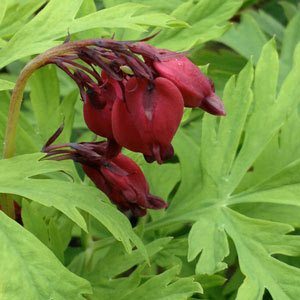 This is a spring to autumn flowering perennial, and you will that Dicentra formosa grows well in part shade. The flowering time will depend on moisture and the amount of shade. Here in the foothills, it flowers for us twice a year in spring and also in autumn. Over summer it simply goes dormant and reappears as the weather cools down and moisture increases. Attractive pink heart shaped flowers and ferny foliage make this a must for the shaded rock garden. Excellent when planted beneath deciduous trees of in any area of dappled shade. D. formosa alba is similar except with white flowers. D. formosa ‘Bacchanal’ is an attractive form with the same green foliage but brilliant crimson red flowers. Planted between Hostas and other shade loves this is an easy care species which spreads by underground rhizomes. Remarkably drought tolerant as it seems to just go dormant in dry summer conditions, to spring back to life as soon as in rains. Reaching around .4m in height in good conditions the flowers hang in a nodding manner and are backed by the mid green foliage. Also referred to as the ‘Pacific Bleeding Heart’ this is a native to California and nearby states. A little moisture diring dry summers and some fertilizer either in slow release form or a liquid seaweed. Mulch when dormant to help provide a humus rich cool root run. No extra care is required. 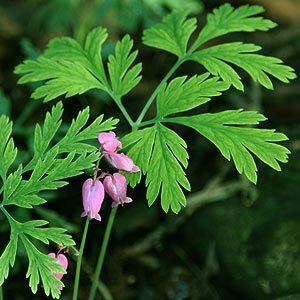 Dicentra formosa are available for sale from the following participating nurseries.